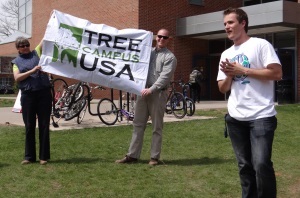 UConn recently learned that it is the first college in Connecticut and only the third school in New England to be named a Tree Campus USA by the Arbor Day Foundation. The University joins a group of almost 200 schools nationwide that have earned this distinction for their commitment to tree conservation and preservation. Former Vice Provost and emeritus EEB faculty member, Greg Anderson, co-chairs the UConn Arboretum Committee and was thrilled by this accomplishment. UConn’s plan was developed by the Office of Environmental Policy in conjunction with the campus tree warden and Arboretum Committee member, Eileen McHugh, who also spoke about the tree campus designation.